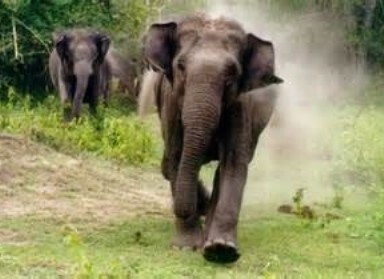 Ranchi: A herd of rampaging wild elephants have killed five people in the last one week in Jharkhand’s Pakur, Jamtara and Dumka districts, forest officials said on Tuesday. The fifth person was trampled to death late on Monday in Pakur by the elephant herd. According to forest department officials, the victim, Amanuwal Hembrom, 30, a resident of Khhassa village was one of the members in a group that was trying to chase the herd away. Subsequently, a mob on Tuesday blocked the national highway in Pakur demanding action and compensation. The herd has been rampaging through the Santhal Pargana region. According to reports, the elephant herd first entered Jamtara district and trampled three people to death on different days. Later, the herd entered Dumka where one person was trampled to death. The herd also includes baby elephants, that has wrecked havoc, damaging standing crops and houses, a forest official said. Atleast 700 people have been killed by elephant herds in Jharkhand since its creation in 2000.